Why not have your print delivered framed and ready to hang? 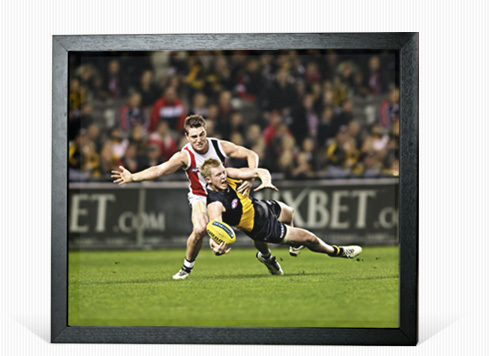 Premium photo frames are now available. Made from quality Australian timber and stained black, framed prints make the ideal gift or even a great decoration for the office. Clear acrylic is used instead of glass as it has excellent UV blocking properties, is optically clearer than glass and will not shatter during shipping as glass can. Frames are delivered ready to hang with plastic coated stainless steel soft-strand wire anchored on either side of the rear of the frame with D-rings. Framed prints are available in three popular sizes: 8x12 inches, 12 x16 inches and 16x20 inches. All frames are delivered in crush-proof packaging within seven working-days of ordering.